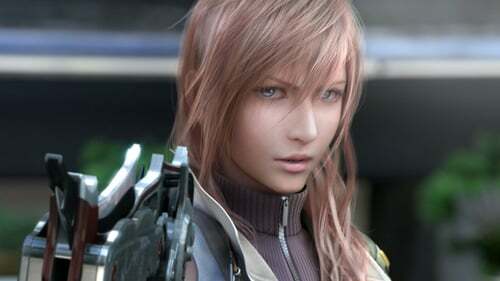 Review Final Fantasy XIII is one of the most anticipated releases of the past two or three years. As it dropped through the post box I steeled myself for at least a week lost in a world of futuristic Noh theatre. 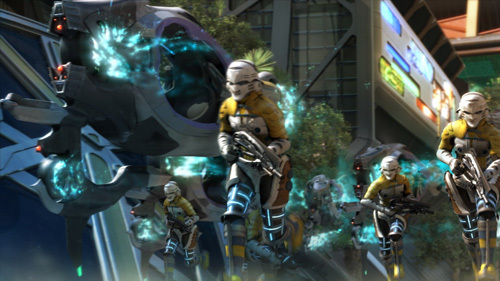 This feeling was enhanced by the circulating rumours about the epic length of game play, made bearable only by a stunning variety of scenery and enemies. I played this game on my PS3 but I am also going to take a look at how the game behaves on a recently abducted Xbox360. That Microsoft managed to get a release of this long standing PS3 franchise suggests a coup for Bill Gates but if graphics and game play are inferior, this is a revolution with no teeth. 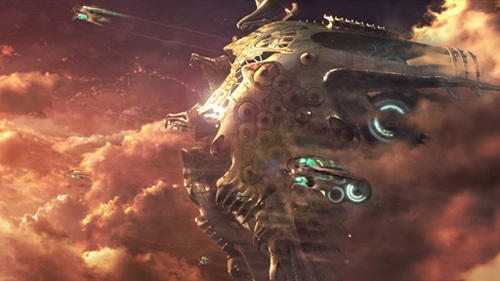 Final Fantasy XIII takes place on Cocoon, a floating landmass that hovers above Gran Pulse. On Cocoon the populace is sheltered from the feared Pulse brainwashed into believing it is some kind of hell. Every so often parts of the population are purged down to Pulse as some kind of punishment. This is where the game starts as a purge is taking place. 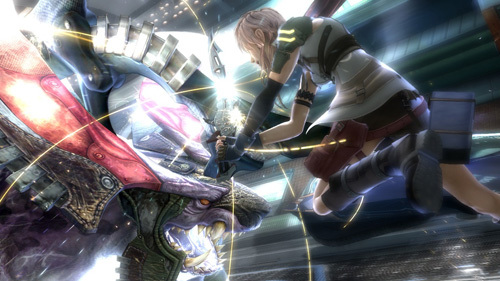 The story follows fairly standard JRPG (Japanese role-playing game) conventions. You control Snow, Lightning, Sazh, Hope, Fang, and Vanille. You follow your alter egos’ stories through lengthy cut scenes and 50-plus hours of fights. 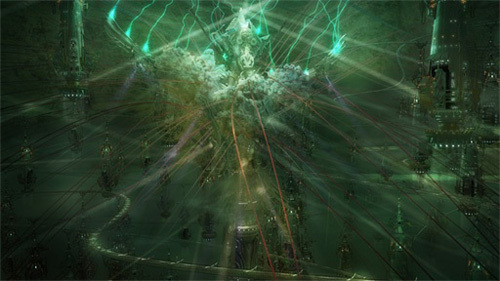 FF XIII takes these conventions and puts them through an HD kaleidoscope. Even comparing this to God of War III, the graphics are impressive. From the early cut scenes that pull you in, mesmerizing you with glowing fluorescent blues to the paradise of Grand Pulse, these visuals pack a punch. My biggest problem with the game was the first few hours, which pretty much involve running down linear corridors and pressing X. It’s very very easy to get tired of running down straight metal grey matrix-style corridors and pressing x. I felt it was bad design to have such a long game that doesn’t grab you and pull you in right from the start. In the beginning there is a distinct lack of challenge to the battle system; the enemies are weak and you hardly have any need to paradigm shift. The Paradigm Shift system lets you assign class roles to each character, putting them in offensive, defensive and healing roles with names like Peacemaker, Medic, Sentinel, and Commando. You can combine Paradigm Shift with command queuing, letting you own most enemies. Once you get past the initial stages of the game, this system becomes much more exciting and fluid. You start really having to plan your paradigms carefully, which is where you finally get a challenge. As a learning curve this increase in difficulty does make sense, but it makes the beginning of the game slightly tedious. Usually I love the turn-based system; unfortunately I hated the system in Final Fantasy XII as it was too much like a real time RPG. 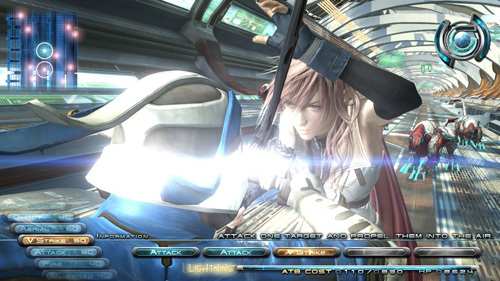 Final Fantasy XIII creates a happy medium between turn-based and real time, I like the fact that you can see your enemies on the field; pre-emptive strike becomes a really useful tool later in the game. "Look behind me? Do you think I'm stupid?" 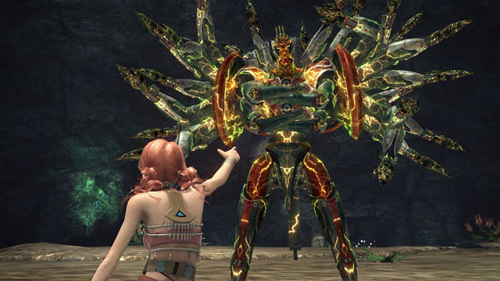 There are also some really great boss fights, although some fiendishly annoying ones too. Talk to anyone who's played past chapter 11 and mention Barthandelus and I'm pretty sure they will all get that same look, like they want to punch something. The design of the bosses is as impressive as I've come to expect from Square Enix. If you stick with this game and make it past the first 10 hours probably the most noticeable thing is the development of the characters. At first they are a little one-dimensional. “Hi I'm hope and I can't do anything because my dad doesn't love me.” “Hi I'm lightning and I deal with things with my fist because I can't bear to deal with my real emotions.” etc. etc..
Happily, the characters’ story lines develop nicely and I actually started to like most of them as people. 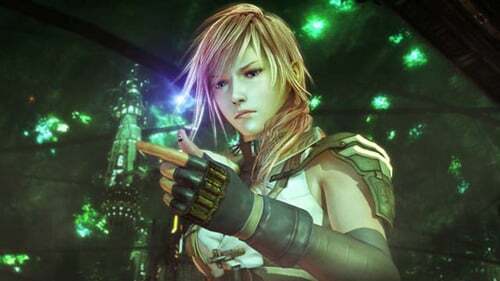 Even Vanille, who I really hated to start with (and is it me or does she make really sexual noises when she casts magic??) has an interesting story once it unfolds. The relationship between characters and how they help each other through situations and "face their destiny" is quite uplifting (incredibly cheesy but moving nonetheless) I thought the soundtrack was awesome (minus Leona Lewis who plagues the final cut-scene) and the cut-scenes were lovely. The lack of rewind feature to re-watch the cut-scenes later on is a shame. There is very little outside the main linear story in the way of side quests until after you've finished: this is disappointing. [Although I admit I’ve done most of the mini quests, mostly so I could get me a Chocobo.] There was none of the kind of patented RPG wandering around towns talking to people trying to find that one who would tell you what the hell you were supposed to be doing and I found this refreshing. Commerce is handled by interacting with regularly spaced mini robot terminals through which you can buy, sell and save your game in a futuristic internet shopping experience. Playing this game on the Xbox was a touch disappointing. After the PS3, it seemed like a stripped down version of its rival console’s game play and visuals. Lack of resolution makes the 360 version look shabby upscaled to 1080p. The razor sharpness of the PS3 visuals - even when there is loads of motion - has been compromised on the 360. Don’t get me wrong, it still looks good, but considering Final Fantasy has its bedrock in stunning CGI, it’s just not good enough. 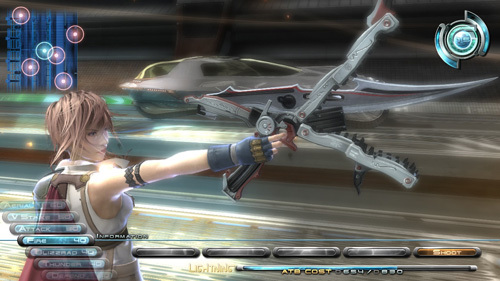 Square Enix obviously took the scalpel to its Crystal Tools engine to translate Final Fantasy XIII across to the Microsoft platform. I feel sorry for whoever had the job of compressing 32GB of CGI to fit three Xbox 360 DVDs around 7GB. I think this was only possible because the game is extremely linear most of the way through. The encoding that has been used for the compression of the data to take this game cross-platform isn’t really as good as it could be. It leaves the environment and enemies with noticeably less detail in texture; strangely this seems to affect the characters clothing more than their features. But if you can live with this, which I am sure 99 per cent of people who only own a 360 can, the game is still worth it. However, if you have both consoles at home, there really is only one choice: PS3. Not so much a coup de maître for Microsoft after all then. After 50 + hours of my life lost to Square Enix and a rethink of my initial reservations I really liked this game, I know a lot of FF fans who didn't because it's different from previous instalments, but I think Square Enix did a very brave thing. Too many game developers these days spend their time making sequels which only differ from the original by a smattering of new features - all in the hope of the most profit for the least effort. Square Enix could've easily made a game exactly the same as FF7 and people would still buy it, but they did something a lot of companies don't have the guts to do: take a really popular, long running, fan loved series and re-invent it. It worked very well and I think that's something they should be commended for. It feels like a labour of love not a cash cow and that’s one of the reasons I love this game.